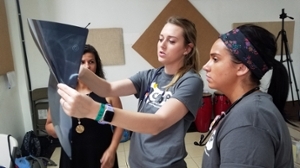 Southern Illinois University Edwardsville’s commitment to service was again on display as the School of Nursing took a nine-person team comprised of students, faculty and an alumna to Costa Rica Jan. 5-12, where they saw nearly 1,000 patients in four clinic days at four locations. 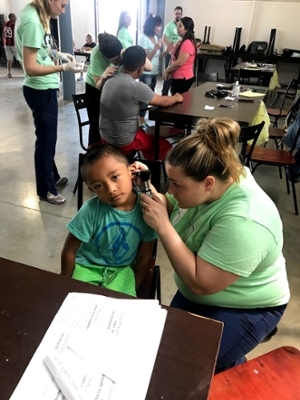 Valerie Griffin, DNP, assistant clinical professor and director of the Family Nurse Practitioner Program (FNP), led the team that traveled in partnership with Central America Mission Projects (CAMP). In seven days, they visited La Carpio, Pavas, Alajuela and Coco, fed children in the street at Infiernillos and played with children at Ninos con Carino Orphanage. Joining Griffin and her daughter Hannah were Leah Baecht and Whitney Heischmidt, who are both post master’s doctor of nursing practice students and faculty in the Certified Registered Nurse Anesthetists (CRNA) program. CRNA students Alexis Tewell, of Freeburg, Michael Perkins, of Worden, and Megan Reynolds, of Hamel, were team members, along with FNP students Amanda McDannald, of Rochester, and Marissa Mahan, of Chatham. Rounding out the group was SON alumna Mackenzie Schutt, who was master of ceremonies at the School’s October 2018 Gala that focused on global service. CAMP President Dan Whitlock and SIUE Chancellor Randy Pembrook convinced her to join the group. The team dealt with some serious issues such as diabetes, hypertension, cellulitis, skin cancer, tuberculosis and a wound requiring stitches. Griffin points to a positive learning experience, because students are taken out of their comfort zone. “In the United States, we have many resources available in order to care for patients,” she said. “In Costa Rica, these resources are limited. Students acknowledge this and care for their patients using more than just clinical skills. Photo: (Upper Right)-Amanda McDannald assesses the ears of one of her patients. Alexis Tewell and Marissa Mahan review an x-ray of one of their patients.